“On your feet now – applaud God! Sing yourselves into God’s presence. God made us; we didn’t make God. We’re are God’s people, God’s well-tended sheep. Worship at Grace UCC is energetic! “The church is alive!” Our worship service helps us connect with the living God. 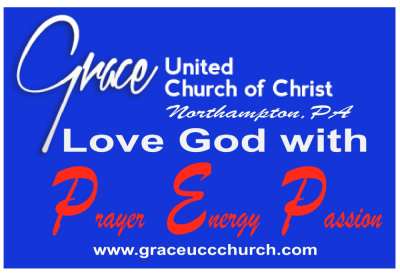 At Grace UCC we worship Sunday at 10:30 a.m. during the school year and 9:30 a.m. in the summer. We celebrate communion on the first Sunday of the month. Our services include prayers, reading scriptures, music, and a sermon on the scriptures for the day. The worship service usually lasts about one hour. We are a traditional church following a liturgy, using responses that help us connect with God. Each of us connects with God very differently. For some of us we find God through the spoken word, others through the music that is played, and still others by the silence of prayers. Each week our services try to help people connect to God by differeing experiences in worship. After all worship helps to shape us as Christians and to have a relationship with God. Worship centers us so that we can go out into the world to live what God has taught us! We go out into the world to and follow Christ’s teaching and to help others in the community. Recently Grace has redefined its mission. Our upcoming Mission Statement will help us live out our passion for Christ. What is your passion and how can you live out your passion to change the world?